It’s been a while since I “dropped out of the keto lifestyle” and gained back all the weight I originally lost (plus more, to be honest). It’s time to go back to the only way of eating that will help me lose weight and keep it off. For me, Keto is now a way of life, not just a temporary diet. I’m really hoping that my story will alert (and inspire) other women about the medical dangers of ignoring too much body fat. I’m not one for the whole “doctor scene.” The only reason I have a primary care physician is because about a year ago I couldn’t ignore the dizzy spells I kept having at the morning meetings at work. Turns out my blood pressure was 180 over 100 and I needed some medication to lower it, but otherwise I’m fit as a fiddle. Until this year. I went for a check up in February and just happened to ask the doctor if it was okay that I had “spotted” recently. I’m mid-50’s and went through menopause a couple of years ago. The doctor lowered his clipboard and took on a serious look. “No, it’s not okay.” Turns out this is one of the primary symptoms of uterine cancer. EGAD. So, I had a few tests. Each test was supposed to disprove the cancer, but each test led to the final diagnosis that I had “atypical adenomal hyperplasia” – or an enlarged endometrial lining with precancerous cells. The surgeon recommended a complete hysterectomy. This calls for 3 days in the hospital and 6 weeks recuperation – and everything goes. After taking a vacation break (physician approved), I went back to the surgeon to discuss the whens, wheres, and hows of this upcoming surgery. He explained it would be a little more complicated because of my weight. There were dangers of blood clots in my legs, so he’d put me on blood thinners, I had more chance of infection, etc. etc. etc. OH MY GOD. I asked if it made sense for me to hold off on the surgery and take a few months to lose weight, say 6 months and 50 pounds. I told him I’d been on the keto diet a couple years ago and lost nearly 40 pounds in a few months. The doctor got excited and said, “YES!” Turns out weighing less will make the surgery go a bit smoother. It also turns out that I could avoid surgery completely and even correct the problem by losing weight. In my case, (and in layman’s terms) the body fat messed with my hormones, which produced excessive amounts of estrogen, which caused cells to form and thicken my endometrium. Excess cells mean more cells that can turn cancerous, and mine have about a 30 percent chance to do so. The excess cells were removed during the D&C/biopsy, but will grow back from the same process: fat > estrogen formation > thickened lining > atypical pre-cancerous cells, etc. etc. The doc said it’s safe to wait a bit because the cells were focused and not spread throughout the tissue. So he was whole-heartedly behind me losing weight before doing the procedure and even encouraged me that I could stop this excessive estrogen problem. I asked how much I need to lose to stop the cycle. He said every pound counts. So think about it, this surgeon who would make money off the operation is rooting for me to not have it and to even lose enough to avoid having it in the future. I like this guy! So here I am. I left the doctor feeling like I’d had my sentence commuted. Talk about motivated! This is seriously the most inspiration I could need or want to lose this weight once and for all. I need to lose more than 100 pounds, and the only hope I have is keto. I know I can do this. My husband is backing me one hundred percent. 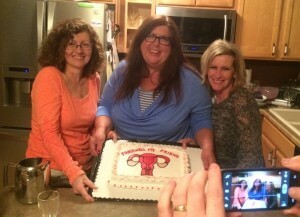 My friends are cheering me on (despite the fact that they had gotten me a lovely “Farewell my friend” cake with a uterus drawn on it in icing). I know I need to immerse myself back into all I learned on keto last time. I also know that keto subreddits inspired me alot with success stories, the really supportive people/comments, and the delicious recipes that kept me enthused. Last time I did keto, I lost the pounds quickly, started a “Healthy Keto” recipe blog, and felt more successful at losing the weight than I had in years. Then, (who knows why?) I just quit, and gained back the 40 plus another 10! This time I know it’s forever. I don’t want cancer. I don’t want to be this fat. I don’t even want to take a blood pressure pill every day. I’m too old to keep up this yo-yo diet thing. I need to eliminate carbs from my life for good! So, I’m back to cauliflower mashed potatoes, and lots of omelets, and squash “pasta” tricks. I wonder if there are other women out there who have stopped their estrogen-related medical problems by doing keto. I’m geeked, but Im back. I visit the keto subreddit several times every day as my “one day at a time” support group! Everyone there understands how hopeful, yet fearful, I am. I need to be successful this time and for good! My life really does depend on it. It’s day 5 and I’m going strong. Wish me luck!